Living Online: Online Business Site Sells Fake Handbags, Legal Or Not? Online Business Site Sells Fake Handbags, Legal Or Not? Everytime while I went China Town in New York City I saw some Chinese people try sell some famous brand of handbags, such as Louis Vuitton, Gucci, Prada. I know these are illegal copied products, but who care about that if the price is cheap and nice quality? I know these breand's products have very good quality and design, but their price also are very high. I love brand product but most time I can not afford them, I also do not like fake one, so most times I just waiting for season over and the price reducing or just do window shopping. 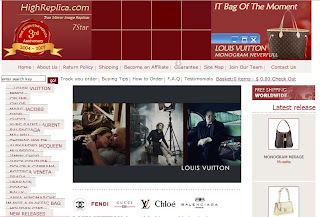 Yesterday, I read a blog that introduce a website which sells replica handbag products including: Louis Vuitton, Gucci, Prada, Chanel, Fendi, Marc Jacobs, Dior, Yves Saint Laurent, Balanciaga, Miu Miu, Thomas Wylde, Alexander McQueen, Mulberry, Jimmy Choo and Juicy Couture. I know some online vendors sell fake stuff, but I was really surprised about Highreplica that looks pretty good an online business site. The logo shows it do this business since 2004, website was registered in Malaysia but factory located in Guangdong of China. It called itself "The 7 Star Replica", guarantee their product's quality, even it has return policy. Frankly, it looks like a real online business site but actually that is illegal.